4. 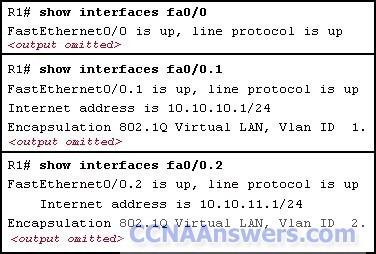 What is a function or characteristic of the native VLAN? 6. Which combination is required to establish a connection to initially configure the Linksys WRT300N wireless access device? Refer to the exhibit. SW-T has been configured with a single trunking interface. Which VLANs will be allowed across the trunk? All configured VLANs will be allowed across the trunk. Only the the management and native VLANs will be allowed across the trunk. Only VLANs that are configured on the VTP server in the domain will be allowed across the trunk. Refer to the exhibit. Hosts B and C attempt to transmit a frame at the same time, but a collision occurs. Which hosts will receive the collision jamming signal? Refer to the exhibit. The switch VTY lines have been properly configured, but PC1 is unable to remotely manage the switch. How can this problem be resolved? Refer to the exhibit. R1 is configured for traditional inter-VLAN routing. R1 can ping computer 3 but cannot ping computer 1. What is a possible cause for this failure? S1 port Fa0/11 is in the wrong VLAN. Refer to the exhibit. The network administrator is planning five additional VLANs to be shared throughout the VTP domain on S3. What action should the administrator take before creating the additional VLANs? 15. An administrator is troubleshooting a PC on the network which is suffering from slow and intermittent connectivity. The PC has a ping success rate to the default gateway of less than half the ping attempts. Other PCs on the switch can consistently ping the default gateway. The switch port is configured for auto duplex and the PC is configured for full duplex. What will commonly cause this problem? 17. Which switching method provides error-free data transmission? 18. Which wireless topology supports roaming from one access point to another? 19. 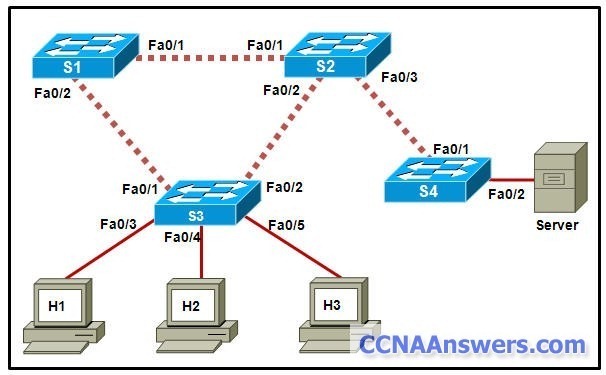 Which value determines if a switch becomes the central point of reference in the spanning tree topology? Refer to the exhibit. The broadcast traffic from PC1 is consuming bandwidth on the interswitch trunks. What should be done to prevent this from happening? Move PC1 to a port on SW3. Move PC2 to a port on SW3. Move PC1 to a port on SW2. Enable pruning for VLAN10 on the VTP server. Associate PC1 as a member of a new VLAN. Refer to the exhibit. What happens when a frame from a source MAC address different from 00a8.d2e4.ba27 reaches switch port 0/5? FastEthernet port 0/5 will show an err-disabled message. 22. A wireless access point is configured for WPA2. Which encryption algorithm will all devices that connect to the access point be required to use? 23. Where is the information of newly created VLANs stored on a switch? Refer to the exhibit. A new switch, SW3, has been added to the network. The network administrator determines that VLAN information is not propagating to SW3. Which command will remedy the problem? 27. Which STP port type can only appear once on a segment, and must be present in order for traffic to flow on that segment? 28. What is one disadvantage that 802.11a wireless has compared to 802.11g? 29. Why is MAC address filtering considered a poor choice in securing a WLAN? 30. What is the purpose of the Spanning Tree algorithm? 32. What is the purpose of VLAN trunking? It improves network performance by reducing broadcast traffic. It selects the best path to transmit data in a switched network. It carries the traffic of multiple VLANs through a single link. 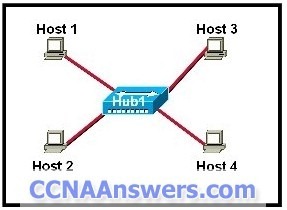 It avoids spanning tree loops in a switched network. Broadcasts are natively blocked by the switch. Subnetting is used by the switch to segment local networks. Frames that contain an unknown destination MAC address are dropped by the switch. The source MAC address within a frame is used by the switch to associate a port with that MAC address. Frames are directed by the switch from one port to another based on the destination MAC address within the frame. Data packets are forwarded by the switch from one port to another based on the destination IP address within the packet. 36. Which statement correctly describes a function of a Layer 2 switch? It routes packets between different LAN segments. It uses the destination MAC address to selectively forward a frame. It performs switching and filtering based on the destination network layer address. 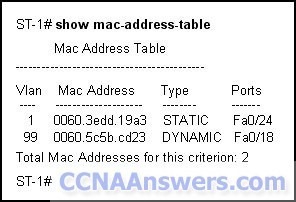 It drops a frame whose destination MAC address is not in the MAC address table. Refer to the exhibit. 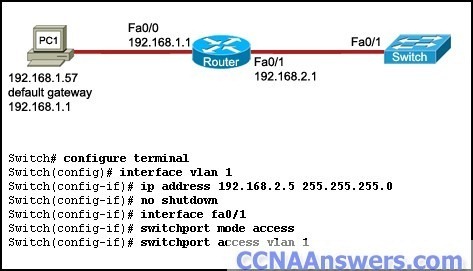 Hosts that are connected to switch SW1 are not able to communicate with hosts in the same VLAN that are connected to switch SW2. What should be done to fix the problem? Introduce a Layer 3 device in the topology. 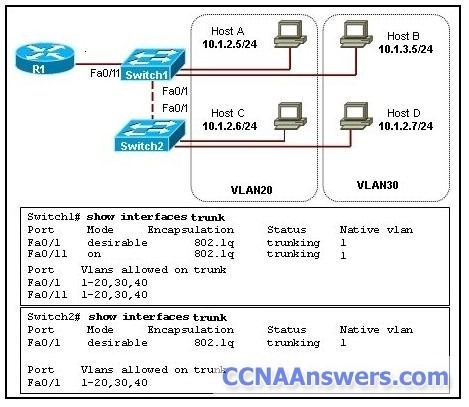 Configure both switches in VTP transparent mode to allow them to share VLAN information. Reconfigure the fa0/1 interface on switch SW1 with a static trunk configuration. Apply IP addresses that are in the same subnet to FastEthernet 0/1 on SW1 and FastEthernet 0/2 on SW2. Configure the same native VLAN on both ends of the trunk. Refer to the exhibit. What is the maximum number of VLANs that can be deleted from the Switch as it is configured? 42. What is the benefit of the auto-MDIX feature on a Cisco Catalyst switch? 43. A network technician is attempting to configure 802.1q trunking on switch ports Fa0/5 through Fa0/10. Which set of commands will accomplish this task? 44. What can an administrator do to ensure that a specific switch will win a root election if all switches are set to their default configurations? Set the bridge priority to 16384. Change the VTP mode to server. Assign a port priority of 128 for all ports on the switch. Configure a loopback interface with the highest IP address. 45. Why is it advisable that a network administrator use SSH instead of Telnet when managing switches? 46. What will be the effect of the command S1# copy system:running-config tftp://172.16.2.155/tokyo-config? 47. 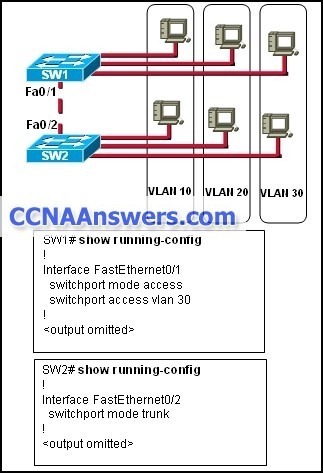 What is the purpose of the switch command switchport access vlan 99? 48. Which Cisco switch feature is used to limit the number of valid MAC addresses that a switch associates with a switchport? 51. RSTP is enabled in a switched network that is active and converged. Which switch port type assumes a discarding state on non-root switches?